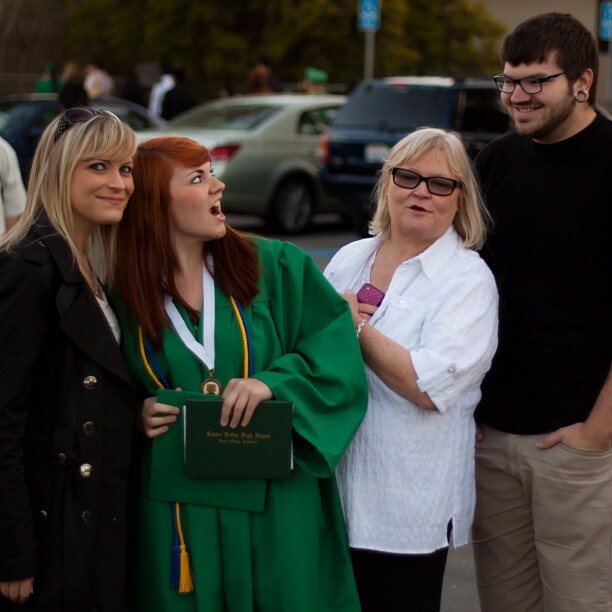 Me with Libby, Johnna and Robbie, at Johnna’s graduation. I did mention she is in theater, didn’t I? Well, the nest isn’t exactly empty. In fact, by anybody’s standards, it’s pretty darn full. At this moment, I have four kids between the ages of 18 and 26 living with me. And for a family as large and as grown-up as they all are, we remain pretty close. My kitchen sees some pretty crazy conversations, and even Libby, who is 26, calls me when something happens that makes her either really happy or really sad. And I love this. But … well, sometimes there is just a confluence of events that make you suddenly notice that life has shifted dramatically? That’s how it’s been for me this past week. As you know if you have been reading my blog, my youngest graduated from high school. That’s a milestone event of course, but one that often slips by without that much of a noticeable change in the air. This last week I also bought her a new car as a graduation present. Well, a new used car, but one which is reliable, and which gets good gas mileage … and this has had the effect of freeing her up to pretty much go anywhere she wants anytime she wants. I’m guessing I will be seeing a bit less of her than I have in the past. But it dawned on me a couple of days ago that there has been another change. Johnna always used to say that I was her best friend, and we used to spend a lot of time together talking, figuring out life, the world, people. She had a large group of friends, some quite close, but for the important stuff she always came to me, even if she also talked to her other friends about it. Now, however, she has a new boyfriend, and I realized that he has become her best friend. I’m telling you, those two seem to be talking in one way or another every waking minute of the day. It’s pretty amazing, actually. But she has far less time to talk to her mom, and when she does have free time, she doesn’t seem to have that much left to say. She has already discussed everything with her boyfriend. These days, I guess they are figuring out life together, and as a mom I couldn’t ask for better for my daughter. The other thing, though, is probably just that she is happy, and honestly a lot of our conversations had to do with sorting through feelings that were difficult for her to process. If you think I am complaining, I am absolutely not. I think this is the best thing in the world for her. But I did suddenly feel I had a little less immediate purpose in life. And I did have to stop and consider what it all meant for me. I have spent the last more than 30 years putting my needs far beneath the needs of my children’s needs, and I am sure that will continue for the rest of my life, but suddenly I find I’m at a place where my own needs can actually take precedence. Pretty amazing. So the first thing on my list is to get down to the really painful work of writing my book. I have an aunt in England who is going to be 92 next month, and I had a conversation with her last week in which she informed me that she is waiting to read my book. I have to take that seriously, you know? I have put it off and put it off because first of all I was busy with other stuff … but also digging into the emotions necessary for the book is very painful, as is the whole process of the writing. I can’t use outlines. They just don’t work for me. Writing is a purely organic process. But sometimes it’s hard to catch everything in that organic flow. Also I am so terribly critical of my own work that I can, and have, ended up writing the same chapter over and over and over again. I also want to get serious about my health, and yes even my appearance. I just haven’t really cared all that much about the latter for awhile now. I’ve thought, oh, I really need to eat right and exercise … but not for my sake! Again, it was so I could be healthy and live a nice long life … for my kids! That’s valid, of course, but you really have to want to do something like this for yourself. So now I don’t have to deal with school schedules … for at least a long while now, nobody is even likely to be up and around in the mornings to talk to and distract me … this would be a great time to start that morning exercise routine I have been meaning to start for so many years! Anyway, for those of you who are wondering, we did record Johnna’s commencement address — not a professional recording by any means. Libby is working on trying to get out some of the shakiness, since it was done on zoom from a fair distance. The audience was pretty abysmally noisy as well, with people still coming and going, clomping up and down aluminum steps. But hopefully you will be able to see and hear well enough, and I will publish the text as I promised. I was actually somewhere around Johnna’s age when I came up with my own idea of life as a road. I’ve raised five kids and none of them has ever grasped that concept, or even probably a need for such a concept. But Johnna has grasped it, and has made it her own, as you will see in her speech. And whither then? I cannot say. Sorry, I can’t seem to stop the Tolkien quotes. But it’s just this, at whatever ages and stages we may be in, the fact is that a new adventure is about to begin for our family. I’ll keep you posted. I think so, too. With pictures from when they were babies and toddlers I have to look at the surroundings sometimes to figure out whether it is Libby or Michaela. This is one of the reasons I have never held much with the age progressions — because they didn't look like Libby. Or Robbie or Alex for that matter.